This article is about growing courgettes and we concentrate on the low growing bush varieties which are by far the commonest form in the UK. These are one of the easiest vegetables to grow although they may well need protection from slugs and snails in their early stages. Once growing away water is their prime need. Leave them to sprawl over the soil where they want. To get the best from your courgettes they will need to be harvested regularly. 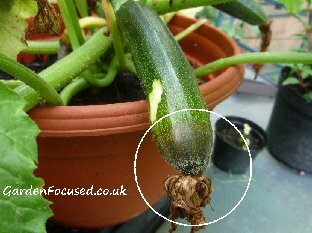 Let even one courgette grow to marrow size and the plant will stop producing. Pick them regularly however and you will have a delicious crop right up to October. To adjust the calendar dates for your town, click here. Courgettes appreciate as much sun as they can get in the UK and don't give of their best in shade or partial shade. As well as liking sun they also like lots of water so a position near a water source for manual watering may well be a good idea. Their other main requirement is a soil which is full of nutrients including nitrogen. In times gone by courgettes were planted on the top or near to compost heaps because they appreciated the high level of nutrients this position gave them. You may not have a suitable compost heap ut a rich soil will do well. The best plan when growing courgettes from seed in the UK is to sow them in pots indoors and then plant out when the danger of frost has passed. Two or three courgettes plants is enough for most people so it's easiest to sow the seeds into individual pots. In the third week of April sow one courgette seed in a 10cm / 4in pot full of general purpose potting compost. Water the pot until the compost is moist. Courgettes have a very high germination rate (around 90%+ will germinate) but sow a couple extra just in case. Courgette seeds will geminate in a temperature range of 13°C / 55°F to 25°C / 75°F with an ideal temperature being around 20°C / 68°F. Store the pots in a warmish place (no light required initially) and when the seeds sprout above the surface move the pots into a light position out of direct sunlight, a windowsill will do fine but beware of cold night temperatures. If space on the windowsill is running out the seedlings can be placed in a propagator and placed in a light (not direct sunlight) position outside. However you will need to bring them in at night to prevent them being damaged by late frosts. In the third week of May gradually harden off the young plants for a week or so. The courgettes will be ready for planting outside in their permanent positions in the last week of May. Dig a hole two or three times the size of the pot and thoroughly break up the soil to a crumbly texture. Adding some well rotted compost or potting compost into the soil will give your courgettes the best start to their outside life, a handful of blood, fish and bone also sprinkled into the soil will provide long-lasting nutrients. Plant the courgettes to the same depth in the soil as they were in the pot carefully and gently firming the soil around them. Allow about 90cm distance between the plants because as they grow they tend to sprawl over the soil surface. Young courgette plants are a particular delicacy for hungry slugs so slug pellets and possibly some form of barrier may be required for a few weeks. If your soil is nutrient rich the main care need is for water. A mulch of organic matter in the second week of June around (but not touching) the stems of the plants will greatly reduce the need for watering. If you are short of mulch use a layer of grass clippings instead which does the job just as well. Water the plants well in dry conditions but don't water the leaves or the soil immediately around the stems. It's best to place a 10cm pot into the soil near the stem and water into that. This will ensure the water reaches the roots but does not rot the top part of the plants. If you have grown courgettes in previous years and the crop has failed to materialise then pollination is probably your problem. To get round this, plant at least two varieties of courgettes. Early fruiting varieties will also benefit from insect attracting plants nearby, calendula are an excellent choice for this purpose. Courgettes will stop cropping if they are not harvested regularly and the speed at which the fruits grow means they should be harvested every two or three days. The ideal length is 10cm to 13cm long (4in to 5in). It's best to harvest earlier rather later. The fruit should start to be ready ready for harvest about eight weeks after planting out, about the the second week of July, and can continue to early October in many areas. Use a pair of scissors or a knife to cut the stalks rather than twisting them off which can often damage the rest of the plant. One of the best varieties especially good when grown as a single plant. Awarded the RHS AGM in 2007 and again in 2011. The fruits are dark green and they grow straight and to a good shape. Good resistance to Cucumber Mosaic Virus. 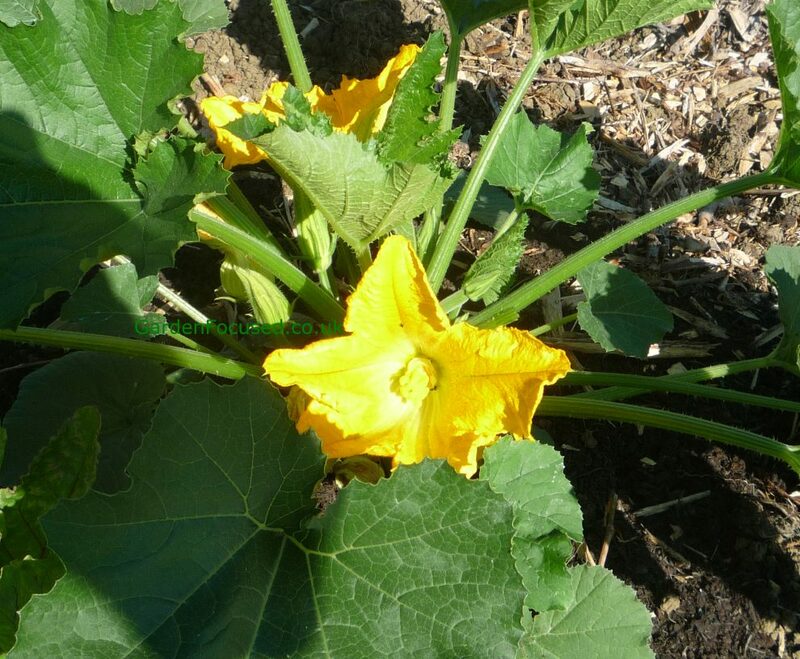 Unlike some courgette plants this variety keeps a compact shape and required less space to produce a good crop. This is an F1 hybrid. An excellent compact growing variety of courgette which crops well, especially so if they harvested when small. The fruits are dark green with good taste. They grow well both in the open ground and also in containers. Another F1 hybrid. For those who prefer non-F1 hybrid varieties this is our choice as the best courgette. The fruits are produced early in the season and they crop over a long time if regularly harvested. The skin is mid-green with yellow flecks. If you ensure the plants are well watered and are planted at the correct distance apart you should have few problems with your courgette plants when they are established. The most common problems are listed below. These can decimate courgette plants before they ever get the chance to produce a crop. Slugs and snails especially like the tender young growth of seedlings. By far the best method of preventing this is to surround the young plants with some form of barrier. The ideal and free solution for each plant is a large plastic squash bottle. Cut the bottom off and place the bottom into the soil around the new plants. Make sure the top is open to allow ventilation. In the majority of cases this will stop the slugs getting at the plants but occasionally they do crawl up the bottle and into the enclosure through the open top. If this is the case place a fine mesh over the top to stop the slugs but still allow some ventilation. As soon as the plants start to fill the bottle remove it. At this stage the leaves are less attractive to slugs and the plants are strong enough to grow through any slug and snail damage. 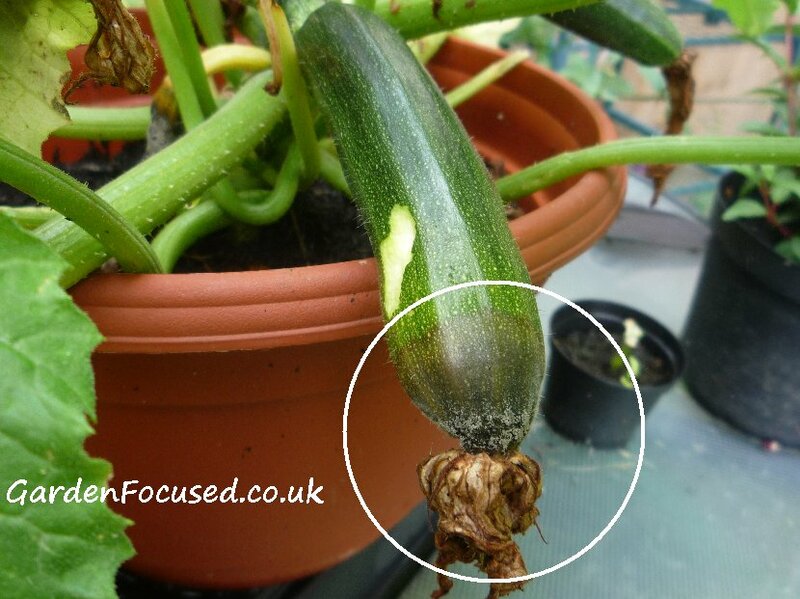 This fungus attacks many plants and trees with courgettes being particularly likely to suffer. It can easily be identified when the foliage has a powdery (like talcum powder) coating on it. The principal causes are an uneven availability of water for the roots combined with a moist atmosphere above ground. Prevent this by watering regularly, mulching well and planting at the correct distance apart. For lots more details on identifying and treating powdery mildew click here. The first signs are a small brown marks on the flower end of developing fruits which quickly covers the whole fruits leaving it as soggy brown lump! The picture below illustrates the early stages of this problem perfectly. If you click the picture you will see it even more clearly. This is caused by dampness and low air circulation, it particularly affects courgettes grown in pots and green houses but can also affect courgette plants grown outside. The key measure is to ensure the plants have good air circulation and lots of sun. If you look at the above picture you will also see that the flower still remains on the end of the courgette and this encourages rotting as well. 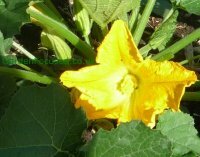 Remove any flowers as soon as the courgette begins to swell because they no longer serve any useful purpose and just trap moisture around the growing end of the fruit. We scraped away some of the skin just above the brown area of the fruit to see if it was edible (see picture above) and it was. So if you see a fruit like this, cut it off immediately to lessen the chance of the fungus spreading and eat the good part. This is caused by poor pollination and not by insects or pests. When the weather improves so will the health of the fruit. To encourage better pollination plant more than one variety of courgette and grow some insect attracting plants very nearby such as calendula.